Rob Thornton's Solo Mountaineering Blog. 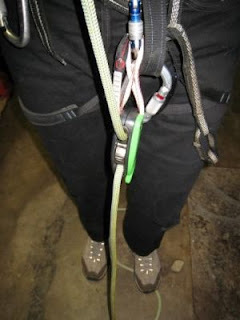 : SOLO SELF BELAY WITH REVERSO & EDELRID EDDY. Its been a while since my last post.I havent been particularly busy,i simply had very little of interest to blog about is all. 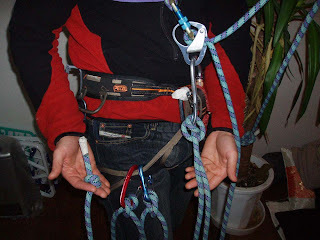 I do read other peoples blogs however and i am including two of particular interest in todays offering.The first is by Andrew Young of New Zealand which demonstrates an interesting solo climbing technique with the Petzl Reverso.This article can allso be found on Andy Kirkpatricks blog.I have not tried this method and thus cannot vouch for it,but it looks promising and may be worth a tryout on your local tame climbing wall. The second is by an American friend who wrote a great blog on soloing with the Edelrid Eddy a few years ago.This technique is very similar to my own with the same device except that it pertains to crag use rather than alpine use.I have used this technique to good effect on British crags and can recomend it. Whatever new self-belay means you decide to adopt,try it out with a belayer in controlled conditions first.This way you can confidently put it through any situation you think you may encounter on the hill,without to much fear of breaking your neck in the process. The Edelrid Eddy is by far one of the safest and easiest belay devices that one can use to adapt to soloing.Its certainly not the cheapest or the lightest (lighter than a Silent Partner though!) 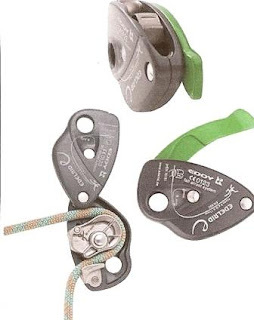 but of all devices on the European market its the only one you can ascend and abseil with without making any structural modifications.It has a very positive locking system (unlike the sprung cam on a Gri Gri)utilising a spring bearing,and even has a failsafe on the belay lever which automaticly locks off the rope if you overcompensate whilst abseiling.I wont bother you to much with the nomenclature you can read it and decide for yourselves.It can take rope dimensions from 11mm down to 8mm which is very usefull to soloists who wish to save more weight (and who doesnt?) on alpine routes.My way of rigging it is straightforward enough with the rope feed running over the shoulder and through a Krab,thence to the device.The rope itself can be draped full length over the shoulder or (as i prefer) stored in a lightweight ropebag in the top of the sack. I attach a large Oval-Krab through a D-Ring Maillon on my harness with the krab passing through both the maillon and the Belay-Loop.The reason i do this is that having fall-tested this system many times, i find the device brakes in a much more positive manner if it does not have to deal with harness-stretch during a fall.I then Larks-Foot a loop of shock cord over the krab,which is then worn around the neck.This pulls the whole arrangement to mid-chest height allowing a good free feed for the rope, and allso giving the device some torque latitude to brake effectively on awkward falls. Clipping the Live Rope into protection. I only use a thin shockcord which will break rather than strangle me in a fall.Used this way i find the Eddy functions better and is easier to operate than when krabbed directly to the harness.It allso makes coming off rope to rig for abseiled protection-retrieval easier and less confusing when one gets tired high on a difficult climb.If your uncomfortable with neck-cords its a simple matter to rig a "Shock cord Baudrier" to slip over the shoulders.The function of the device is as for the Troll-Rocker on ascent (see Troll blog) with the rope clipped into placed protection as it feeds through the device.Have fun!